In February, the shivers of hard winter give way to the winds of early spring. Both, for sure, call for soup to soothe the soul and warm the innards. 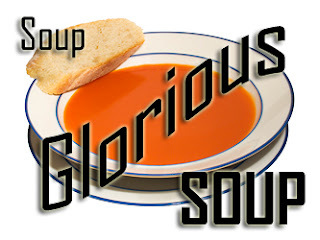 So I dubbed February 2007 the month of Soup, Glorious Soup. I cooked soup all month and invited soup enthusiasts from all over the world to cook soup too. And so they did, in droves. Just like a good potluck, somehow our collection of soup recipes offers a soup for every taste and circumstance. The soups that take hours to simmer stove-top, the ones that toss together in minutes. The soups made from pantry staples, the ones with hard-to-find ingredients. Newly discovered soup recipes and the long-time family favorites. Recipes carefully followed and others invented with what was on hand. I was moved by many of the soup stories, cross-continental stock-making, surviving a first cold winter, falling in love with winter, a first-time soup-maker, the saving grace of soup for a soon-to-be-Mom, a soup passed from one generation to another, an ingredient combination I can't dispel from my brain, the age-old tale of stone soup, and the sweet surprise of a dessert soup! The lucky winner of Nava Atlas' autographed cookbook, Vegetarian Soups for All Seasons is Tanna from My Kitchen in Half Cups! But the real winners of Soup's On are our families and our friends and all who shared all the delicious soups we made. Many thanks, all, for the grand collection of soup recipes. My Kitchen in Half Cups (Tanna from Dallas) - Beef Stock Trans-Atlantic stock, in which Tanna discovers the skimmer. At My Table (Neil from Melbourne, Australia) - Kvas "'Mmmm, beer.' Well not beer in the strictest sense but kvas, a fermented liquid made from rye bread and flavoured with molasses (treacle). What this liquid possesses is a pleasant sourness ... essential to several Eastern European dishes. Fermented soups have a long and proud tradition throughout ... Russia from where this particular soup, botvinya, hails." S'kat and the Food (Shelley from Newport News, Virginia) - James River Clam Chowder "Clam chowder makes one fine meal"
Daily Bread Journal (Toni from San Diego, California) - Cioppino, the Italian New Mexican Way "Can we please have something with chilis in it?" FatFree Vegan Kitchen (Susan from Jackson, Mississippi) - Gumbo z'Herbes with Cajun Tempeh Bacon "Most people outside of my home state have never had this "Greens Gumbo," but it's an authentic Louisiana dish. Traditionally, it was made without meat to serve during Lent, but with Louisianians being the great seafood and meat lovers they are, ham and seafood eventually made their way into this naturally vegetarian soup. Well, now they've made their way out again!" The Kosher Blog (Elf from Massachusetts) - Vegetable Barley Soup "My contribution is a hearty vegetable barley soup that I learned to make from my grandmother. It’s very simple but quite delicious as well as healthful." Bon Vivant (Chelsea from Colorado) - Spicy Winter Squash Soup "Smoky, spicy and intense"
Genuine, Handcrafted Trouble (from Ohio) - Snowed-in Minestrone "The best soup I've ever tasted"
Teczcape (Tigerfish in California) - Cream of Mushroom Soup "Bye bye ... canned soup"
Pickled Garlic (Mathew from Vancouver,BC) - Italian Bean Soup with Cheese Gremolata "Subtly spicy, rich from garlic and cheese, with an interesting nose from cumin and cardamon, and cheap!" Exploring the Silver Spoon (Sara from San Francisco) - Panocotto - Bread Soup "Tasty Factor: A- Ease of Preparation: A+"
Souperior (Fahara from Warwickshire in the United Kingdom) - Spiced Roast Parsnip Soup "A soup to convert anyone who sits on the fence where this wonderful root veg is concerned, and to warm the heart of any soup lover." Je Mange la Ville (Michele from Portland, Oregon) - Porcini & Barley Soup "It's creamy and glorious!" Keep Up With Me (Zandria from Alexandria, Virginia) - I Made Soup: Carrot & Bulgur Soup "It’s the first time I have ever made soup in my life!" Daily Unadventures in Cooking (Katerina from Vancouver, British Columbia) - Roasted Eggplant & Tomato Soup "I actually am drinking some of my soup out of a mug as I write this to help keep me warm." Küchenlatein (Ulrike from Kronshagen, Germany) - Potatoe, Cheddar & Chive Soup "I tried a soup recipe for my new slow cooker. In Germany slow cookers don't have a great vogue, so I bought a slow cooking book. My sons said the soup was the best soup I've ever cooked. It was really delicious!" Kate Bowers Herbed Vegetable Soup - See comments "It is so full of veggies that it is almost vegetable stew. It was an attempt to do a more sophisticated-tasting Weight Watchers zero-point soup." FoodFreak (Petra from Hamburg, Germany) - Sicilian Lentil Soup "... a wonderful light and easy, summerly kind of soup with lots of fresh fennel and a pungent bite of hot pepper, fresh tomato and a drop or two of thick, dark green olive oil ... "
Exploring the Silver Spoon (Sara from San Francisco, California) - Crema Verde - Green Cream Soup What do you make when your guest is a professional chef and culinary artist? Weekly Dish (Jennifer from Baton Rouge, Louisiana) - Vegetarian Tortilla Soup Soup ... "warms me as I cook it, it warms me when I eat it, and it provides food for us on the nights when I just want to come home, put on my pajamas, and crawl into bed without standing over the stove." Everybody Likes Sandwiches (Kickpleat from Vancouver, British Columbia) - Curry and Miso Udon Soup "Warning: This soup also has special powers. ... Use wisely." The Very Important Blog of Elle B (Elle from Santa Barbara, California) - Curried Carrot Soup With Cashew Cream & Curried Zucchini Soup "These silky, creamy and warm-spiced soups will certainly make the last month of winter more bearable." Lucullian Delights (Ilva from Pistoia, Tuscany, Italy) - GREEN PEA SOUP WITH GINGER or CREMA DI PISELLI CON ZENZERO " I made a green pea soup with fresh ginger in it, the sweetness of the peas goes very well with the peppery-sweet ginger flavour and the soup was as nice warm as cold." Akshayapaatram (Priya from Cincinnati, Ohio) - Mixed Vegetable & Orzo Soup "This was one of the best soups I've had. The addition of coconut milk gave it a flavor of Thai food which was yumm." Aroma! (Asha from North Carolina) - Chipotle Corn Chowder "This recipe is from a cookbook called "Hotter than Hell" which I love. I did make changes in the recipe to make it milder to my taste since it's supposed to be very spicy and uses multiple kinds of chillies!" "Nothing like a bowl of soup to recharge the batteries after adventures on a cold winter evening!" FamilyStyle Food (Karen from St. Louis, Missouri) - Tuscan-Style Pasta and Bean Soup (Pasta Fagioli) "I don’t make soup enough, but when I do, the first thing I think of is pasta fagioli, which my mother would often make on meat-free Fridays." Food Lover's Journey (Anh from Melbourne, Australia) - Chinese-style sweet corn soup with baby corn “croutons” "... my greatest discovery in the recent trip to farmers market is ... lovely baby corns. ... Lying inside the thick layers of husk and silk is the tiny yellow baby (corn), something so fragile and delicate. For me, these baby corns are truly precious treasures." JugalBandi (Jai & Bee from "back of the beyond") - 13-Bean, 11-Veggie Soup "You can use any combo of veggies. Just make sure they are diced to about the same size. We used frozen peas, carrots, french beans and, lima beans. We also used fresh cauliflower, broccoli, spinach, chard and peppers, plus a potato, tomato and onion. It’s a great way to use up assorted veggies lying around in the pantry and refrigerator." Four Foodies (Carla from Guam) - Roasted Veggie Soup "I just sort of threw this together as I went with not much of a plan, just a general idea. It hit the spot perfectly, the Hub loved it, so did the kiddos so I'd say a job well done. I will keep this in the back of my mind in the future as it's a perfect way to use random veggies up." CurryBazaar (Jyothsna from Uniated Arab Emirates) - Hot & Sour Soup "I prefer to cook simple and quick to make food and I'm quite satisfied if the end result is tasty." Foodful Thinking (Violetta from Budapest, Hungary blogging from Toronto, Canada) - Velvety Carrot Ginger Soup From another 'newborn blogger', another very first post! "A colourful bowl of silky-smooth carrot soup sets the mood for a decadent holiday dinner. It's so rich and velvety you may think it's made with cream. Not at all!" SuperSpark (Emily from California) - Clear soup with sweet potatoes, silken tofu, and mustard greens "For the tofu lovers among us, this is actually quite a nice little soup and surprisingly filling since it’s loaded with tofu, sweet potatoes, and mustard greens. The bitterness of the mustard greens is balanced out by the ginger and jalapeno flavors ... But the real star of the soup, in my mind, are the sweet potatoes." Kovai-Samayal (Anisha from Coimbatore, Tamilnadu, India) - Mushroom Noodle Soup "Really soup is a fantastic thing to explore with anything...non-veg, veg, egg, greens, hot, cold, chilled..."
Vegetarian Concoctions (Hema from Florida) - Potato & Leek Soup "This time, it is my chance to say ’Ek pathar se do shikaar‘(two prays with one stone). I mixed and matched ingredients from 4 different recipes in 3 different books (Potato, leek and pea soup, Spinach and orzo soup, spring soup with barley and leak and carrot soup)." The Maggpie (Maggie from Saint Simons Island, Georgia) - Elise's Friend Claire's Roasted Red Pepper Potato Soup "Should it ever snow here again, I have the remedy for the stranded snowbird whose island has suddenly become very small. [The soup] is warm and comforting and actually quite healthy." Teczcape: I'm a Foodie (Tigerfish from California) - Beauty Soup - Wakame Soup In which Tigerfish experiments with ingredients unknown. Foodie Confidential (Vidya from Tsuruoka in Japan where's she's the only vegetarian in town!) - Cream of Pumpkin Soup and the very beautiful Two in One Soup and Roasted Capsicum, Carrot and Squash Soup and Broccoli Soup. I think next year it's Vidya who hosts Soup's On! Cafe Linnylu (Linnylu) - Tuscan Tomato Soup "The recipe called for fresh tomatoes ... it was definitely a summer soup crying for dead ripe tomatoes and fresh basil. ... why not use the bottled pasta sauce as a substitute?" Ahaar (Mandira from Buffalo, New York) - Spicy Roasted Sweet Potato & Onion Soup "To celebrate my 100th post, I made this spicy sweet potato and onion soup where the sweetness of the roasted onions and sweet potatoes contrast with spicy green chillies. Added to that is the aroma of ginger and cloves and finally is blended with the tanginess of fresh lemons to make this hearty delicious soup." Cascading Flavors (Ramya from New Jersay) - Forest Greens Kale Soup "I sought the detailed reading from Wikipedia about Soup.It was very interesting article. Finally I conclude that Soup is a big boss and can be served as single feast. If gone wrong, that will refers to my limited knowledge." Jennifer Teaches and Knits (Jen from South Korea) - Not Quite Ratatouille Soup "... here is my favorite soup recipe. Okay it's not really a recipe, more a list of ingredients, but it always tastes great. Except for the time I forgot to add onions and garlic, so it was kind of flavor-deficient." Waisted in the Wasteland (Suzique from New Orleans) - Vegetable Beef Soup Soup's On's very first entry and only 3 WW points! Kalyn's Kitchen (Kalyn from Salt Lake City) - Lentil & Sausage Soup with Cabbage "Looked rather ordinary, but tasted wonderful"
I Think I Have a Recipe for That ... (Kazari from Canberra, Australia!) - Black & White Soup "funky to look at (even dinner party standard, if you like a gimmick), very frugal, very healthy and tastes great"
Peanut Butter Étouffe (Doodles from Florida) - Tortilla Soup "What better way to celebrate the victory of the Colts!!!" La Mia Cucina (Lisa from Cleveland, Ohio) - Italian Sausage Soup with Tortellini "What better a submission than this tasty and filling soup that I simply am in love with"
The Perfect Pantry (Lydia from Rhode Island) - Split Pea, Sausage & Preserved Lemon Soup "This rustic soup, a heartier variation of my vegetarian meat-free split pea, freezes well and is perfect with some crusty bread for lunch on a cold winter day." What's the recipe today Jim? (Rosie from In Limbo, there must be a story there! in the United Kingdom) - Spiced Chicken, Parsnip & Lentil Soup "Perfect for freezing and a great way to use up small amounts of left over chicken." Kalyn's Kitchen (Kalyn from Salt Lake City, Utah) - Chicken Soup with Collard Greens, Carrots, and Brown Rice "I loved the way this turned out." Avenue Food (Sarah from Queens, New York) - Far East Café Seaweed Soup "I grew up eating this savory soup, but I didn’t learn the story behind it until I asked my mom about it for this post. I will resist the temptation to call it “funeral soup” and stay faithful to her recipe, in name and substance." Feisty Foodie (Yvo from New York City) - French Onion Soup "I plan on continuing making soup until the snow all melts." Chez Renée (Renée from southwest Ohio) - Chicken Noodle Soup "Season to taste and cook until done." Mele Cotte (Chris from outside Atlanta, Georgia) - Bomboline di Ricotta in Brodo - Ricotta Dumplings in Broth "... something a little lighter today, but with some substance"
Sour Dough Monkey Wrangler (Dylan from Oakland, California) - Californio Pumpkin Soup When a recipe begins "Feb. 16th, 1863. Dear Uncle Garner," ... you just settle in and enjoy. Jumbo Empanadas (Brilynn from California) - Potato, Leek and Bacon Soup & Crypto-Jewish Brazilian Yellow Stew When Nigella fails you, twice, make soup, twice! Kalyn's Kitchen (Kalyn from Salt Lake City, Utah) - White Bean and Ham Soup with Chard "I didn't know was that when I used red chard, it would give the soup a lovely color. This is truly one of my best soup recipes yet." The Perfect Pantry (Lydia from Rhode Island) - Zuni Corn Soup "When I travel, I look for local cookbooks and wooden spoons to bring home as mementos. This recipe is adapted from Southwest Indian Cookbook: Pueblo and Navajo Images, Quotes and Recipes, by Marcia Keegan, a photojournalist ..."
Kate in the Kitchen (Kate from central Minnesota) - Chili Blanco "This recipe ...was stellar with a capitol ‘S’. Mike slurped from his bowl to get every last drop. Twice. I don’t know about you, but to me, that is an enthusiastic two thumbs up!" Don't Burn Down the Kitchen! (Jesika from South Carolina) - Tortellini Soup aka Sophomore Stew "... an exercise in creativity and foodie adventurism. And because it uses up lots of leftovers, it's a great way to clean out the fridge." What's for Lunch, Honey? (Meeta from Weimar, Germany) - Goulash Soup in which Meeta exchanges " ... bikini, windsurf, flip flops, sun, sand and sea for woolly underwear, turtle necked sweaters, gloves, mittens, snow, ice and scraping the car each morning with numb fingers" and learns to glory in winter. s'kat and the food (Shelley from Newport News, Virginia) - Mom's Chicken Soup with Matzo Balls " ... one of those meals that appeals to the child in every adult. A rich broth bubbles with chunks of chicken and vegetables, but the best part are the fluffy balls of matzoh, guaranteed to cure what ails ya." Once Upon a Feast (Ruth from Toronto, Ontario) - Chicken Soup with Dilled Matzoh Balls "But the soup that always warms my heart and brings instant images of holiday dinners and sick beds is [my mother's] chicken soup with matzo balls. ... now, I share the experience with my older daughter Joanna." Habeas Brulee (Danielle from Brooklyn, New York) - Chicken and Rice, Curry Banana, Roots and Rhizomes Stew " ... this was a stone soup. Remember that story? The poor couple takes in the traveler for the night ..."
Notes from My Food Diary (Eliza from West Linn, Oregon) - Chicken Barley Soup with Vegetables "The recipe is really simple. You could change the ingredients as you like, for instance, instead of the peas you could use peas and carrots ... You could even eliminate the chicken to make it a vegetarian soups and add more vegetables of your choice. The only thing that’s staying is the barley. Barley adds nuttyness to the soup ... "
Tip of the Iceberg (Sally from Iowa) - Beef and Sausage Stew "I decided to make the "chili" that I entered [in a chili cookoff] last year to share with the world. (Lucky world!)" Little bouffe (Little bouffe from Austin, Texas) - Vichyssoise "[Tony Bourdain's vichysoisse] is much more heavily balanced towards leeks, with very little potato. Given leeks' natural richness, the extended simmering time, and the cream, this yields the smoothest, most finely textured soup (of any sort) I've made, yet requires no strainers or sieves." Kalyn's Kitchen (Kalyn's Kitchen from Salt Lake City, Utah) - Chicken and Pinto Bean Soup with Lime and Cilantro "Pinto beans are considered a "good" carb for the South Beach Diet, and soup like this is perfect for any phase of the diet." Desi-Fusion Corner (Pinki from Minneapolis, Minnesota) - Chicken Corn Chowder "This thick and creamy chowder is packed with chicken and corn (Gosh! I put corn in everything!) The use of cream makes it a New England chowder." What Did You Eat? (Sher from Davis, California) - Chicken and Cabbage Chowder "... a delicious soup that was perfect for this dreary, wet weather. It's humble looking, but wonderfully rich and satisfying. If you eat it, you will gain strength to shovel snow from your driveway or sandbag your house from flood waters. Or...vacuum the house." Little Spatula (Katie from Illinois) - Lentil Soup "This soup is a staple in our house. ... Add a little crusty bread and it makes quite a meal. Here I've added prociutto and parmesan cheese rind to the original recipe for a more substantial and rich tasting soup." Lemonpi (Y from Sydney, Australia) - Chilled Green Soybean Soup (edamame no surinagashi) "I wouldn’t dream of cooking up a piping hot pot of soup in this Sydney weather, there’s a whole range of cold soups that shouldn’t be ignored.. vicchysoise, gazpacho, and their ilk." Cook (almost) Anything (Haalo from Melbourne, Australia) - Cantaloupe Soup "I've taken this wonderfully sweet and perfectly ripe cantaloupe and blended it with a little lime juice - served it with a fine dice of it's own flesh and a freshening hit of mint in the form of home-made mint ice cream." Many, many thanks to all who participated! How exciting! I'm in! Do you want us to include 'Soup's On!' in the headline or something similar? Pille ~ Estonian soup, per chance? As you know, I love those northern soups! Use Soup's On as you like, I'm very casual about these 'events'. Mostly it's just about 'playing with our food', something our mothers used to scold about, now something they admire and applaud! OK, I have a new soup recipe I've been working on, so count me in. Oh, I just posted a soup recipe today...well there will be more of them! You just wait! I just did a soup post too! Count me in. l Can tomatoes (almost any size can; diced, crushed, etc. just use whatever you have on hand). 1 bag frozen sliced okra (if you really hate okra, add corn or something else you do like). Cooked barley or other grain to make it even heartier, if desired. Suggested seasonings: Cumin, ground ancho chiles, ground chipotles, crushed red pepper flakes....... any or all to taste, or add whatever seasonings you like. Put crumbles and tomatoes in large pot, add a couple of canfuls of water, bring to a boil, add the frozen vegs and seasonings, simmer for 20 mins or so. Add more water if soup is too thick. Add barley if using and heat through. Diane ~ Your Easy-Meal-in-a-Bowl sounds like a winner! Thanks so much for leaving it for everyone! I will add all my veggies at home and make a sup and sure will ad a link to you. Nice network. 1. Place broth, corn, potatoes, bell pepper, onion, celery, salt, black pepper and coriander into slow cooker. Cover; cook on LOW 7 to 8 hours. 2. Partially mash soup mixture with potato masher to thicken. (Or use immersion blender in parts). Stir in cream if desired, cook on HIGH, uncovered, until hot. Adjust seasonings, if desired, Garnish with bacon if desired. I guess it's trite but considering this response and those above, it's obvious like minds think alike and it really is soup's on in February! I just posted a long time favorite of mine. From Pam, a great-sounding soup recipe with chickpeas which is, she wrote via e-mail, a recipe "... I found not too long ago that I have made for my family and friends. It is great for vegetarians. I find it very satisfying. Hope I win that cookbook!" reduce heat and simmer 10 minutes, or until flavors blend and chickpeas are tender. Stir in spinach in handfuls until wilted. 3. Remove from heat. Add salt, lemon juice, and remaining 1-3 T olive oil. Stir to combine and serve. You can also add some grated cheese to the top of it in the soup bowl, if you desire. Thanks, Pam, this sounds positively yummy! Oh yum! They all look delicious and we're not even to the halfway mark of the month! There's many more sure to be pouring in over the next few weeks. Great event, Alanna! I've been posting a lot of soup recipes lately, but I just found out about this. Wish I'd known sooner, but your feed hasn't been working in my Bloglines for about a week. I'm sure I'll be posting more soups, and I'll be sure to mention your event. I love the graphic, by the way. Did you create that? Susan ~ Oh dear, this whole RSS/New Blogger thing is all messed up. But don't worry, there's the whole month of February for Soup's On. PS The logo came from Luminous Lens, her link's in the post. Nice, eh? She did it a year ago for me when I wanted to take a break over Christmas but took the chance to post a bunch of soup recipes from archive Kitchen Parade columns. Anyway I still really liked it a year later, so there it is! Thx so much for hosting Feb (fabulous) Soup's on! From Elaine in Spokane, Washington (thanks, Elaine!) who says "This is a recipe I adapted from one of the many Vegetarian sites out there. It is so simple, yet creamy and satisfying, even without dairy! This recipe originally was not vegan, not that I am, but I wanted to make it so everyone could enjoy." Heat oil in a large Dutch oven. Add asparagus, onion, celery, leeks and potato, and cook for 5 minutes, stirring occasionally. Add broth and simmer for 20 minutes, until vegetables are softened. Add parsley and cook and additional 5 minutes. Transfer soup to a blender (or food processor) or use immersion blender and puree until smooth. You may need to do this in two stages. Return soup to Dutch oven, add yogurt and stir on low heat until blended. When asparagus is in season, I buy twice what I used to buy, just so I can make this soup to freeze. I am not certain if the nutritional values are correct, what with the changes, but if anything, they will be lower. Optional: 2 medium scallions, chopped; a few baby frozen green peas or edamame; 6 oz. frozen cooked deveined shrimp (thawed, peeled and cut into ½” pieces); 9 oz. firm lite tofu (if use tofu it will add 3 points to entire recipe). 1. In a soup pot, stir together broth, vinegar, hot sauce, soy sauce, mushrooms, bamboo shoots (and baby corn/tofu if you choose). Stir in sugar and cornstarch and simmer 2 minutes. 2. Add any optional items. 3. Serve, sprinkling each bowl with sliced scallions, chives or cilantro. Yields 1 ½ cups per serving. Serves 4. Points per serving: less than 1 without tofu or shrimp. My last post was a highly experimental soup that is based in a few winter roots and fruits. I thought it might make an interesting edition to this slurpy fun y'all are havin'.......let me know. "It is so full of veggies that it is almost vegetable stew. It was an attempt to do a more sophisticated-tasting Weight Watchers zero-point soup." 1. Dice onion, carrots, and celery. 2. In a large soup pot, saute the diced vegetables in olive oil for 5 minutes. 3. Mince and add the garlic. Saute for 2 minutes more. 4. Dice and add the mushrooms. Saute for 3 minutes more. 5. Add the thyme and basil, stir to combine. 6. Add the chicken broth. Bring to a boil. 7. Reduce heat and simmer until vegetables are soft (about 15 minutes). 8. Cut the zucchini into large chunks (about 1 inch lengths or cubes) and add to soup. 9. Simmer until the zucchini is soft but not mushy, about 5-10 minutes. Hi Alanna! I just noticed your focus on Soup from Kalyn's site (Kalyn's Kitchen). I posted "Split Pea Soup" on Feb.15 & would love to enter this soup for your event. Let me know how I should go about this. Can I share someone else's soup? The creamy tomato soup at Homesick Texan is delicious -- I have made it twice already this month! I hope you'll enjoy the book. It's amazing so many entries. I don't now where to start. To try this and that recipe. Thank you Alanna for hosting this "liquid" event. I know this is a very old entry, but many of those links don't work anymore! I had this page bookmarked and I always meant to try many of these recipes and never got around to it! Do you by any chance have this recipe - Pickled Garlic (Mathew from Vancouver,BC) - Italian Bean Soup with Cheese Gremolata - tucked away anywhere? And while I don’t/never did have that particular recipe, I was able to find it via a very cool tool called the WayBackMachine (just google it) which some times has a record of a particular page. In this case? We were lucky! The commenting system won’t allow a hyperlink for some reason, let’s try it this way, you’ll have to copy/paste into your browser.